1.1 This specification covers structural quality carbon-manganese-silicon steel plates in three tensile strength ranges intended primarily for service at atmospheric temperatures where improved notch toughness is important. 1.2 Plates covered by this specification are limited to a maximum thickness of 1.5 in. [40 mm]. 1.3 If the steel is to be welded, it is presupposed that a welding procedure suitable for the grade of steel and intended use or service will be utilized. 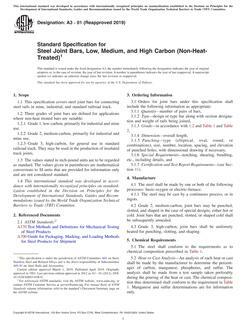 See Appendix X3 of Specification A6/A6M for information on weldability. 1.4 The values stated in either inch-pound units or SI units are to be regarded separately as standard. Within the text, the SI units are shown in brackets. The values stated in each system are not exact equivalents; therefore, each system is to be used independently of the other without combining values in any way.